aA 5' exo-minus, N-terminal deletion of Taq DNA polymerase. bRange of fragments amplified is dependent on what buffer is used. 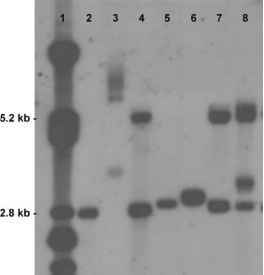 cKOD HiFi DNA polymerase is a recombinant form of Thermococcus kodakaraensis KOD1 DNA polymerase. dAmersham now supplies premixed nucleotide blends (Nucleix Plus PCR) that are functionally tested in long PCR. concentration 50-250 ng. Phage template DNA range 0.1-100 ng. Typical concentration 0.1-10 ng. There is a broad diversity in LD-PCR master-mix compositions and this highlights the necessity to optimize each component in the master mix when developing an in-house method. Foord and Rose reported initial parameters to be used as a starting point for developing LD-PCR protocols. Since then, an extensive range of LD-PCR commercial kits and DNA polymerase mixes have been developed, providing the user with a choice of starting reagents complete with DNA polymerases with their respective buffers, and occasionally dNTP mixes and controls (Table 1). This removes the need to optimize polymerase/proofreader mixes and the buffer composition (apart from Mg2+ concentration), thus saving both time and expense. Initial denaturation: 92-95°C for up to 2 min. mended. Staining with ethidium bromide in conjunction with UV illumination is commonly used to visualize high molecular weight amplicons, although a large (entire) volume of the reaction mix is usually needed to achieve the required sensitivity. To avoid the hazards associated with ethidium bromide it is worth considering the use of the fluorescent stain sybr gold. Like ethidium bromide it binds to the minor groove in double-stranded DNA, and although it can be visualized using UV light it is optimal to use a blue light transilluminator (e.g., a Dark reader, Clare Chemical Research, Denver, USA). One drawback with sybr gold staining is that it can retard movement through a gel, and so it is essential to stain gels after they have been completed. To check amplicon specificity Southern hybridization can be performed, and although radiolabeled probes have been used, it is preferential to use fluorescent-labeled probes or biotinylated probes, which avoid the hazards of working with radioactive material (e.g., 32P). The use of fluorescent-labeled uracil nucleo-tides has also been successfully performed and is another alternative to be considered. Denature: 92-95°C for 10-30 sec. Anneal: >58°C (dependent on Tm of primers) for 3060 sec. Extension: 68°C (with DMSO/glycerol)/72°C (without DMSO/glycerol) for 3-15 min (dependent on size of fragment being amplified). Denature: 92-95°C for 10-30 sec. Anneal: >58°C for 30-60 sec. 30-sec extension every cycle). Final extension/polish: 68°C/72°C for 5-6 min. Another method, based on the above parameters, utilizes primers that bind at 68°C, and so the anneal and extension steps are combined into one. Alternatively, other methods exclude the cyclic addition of 15-30 sec to the extension time and simply have a longer extension time throughout the procedure. All appear to work and it is recommended that different thermal cycling protocols be tried to achieve maximum efficiency.